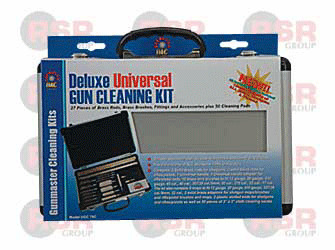 Deluxe 35 piece gun and rifle cleaning kit with Aluminum case. 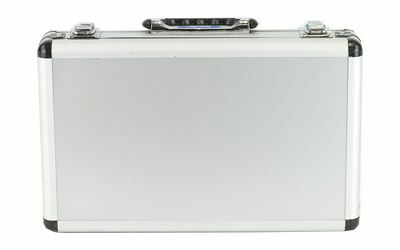 Durable aluminum storage case with handle and heavy duty latches. Fits majority of all shotguns, rifles and pistols. Contains: 3 Solid brass rods for shotguns, 3 solid brass rods for rifles.pistols, 1 Universal handle, 1 Universal handle adaptor for rifle, pistol rods, 10 brass wire brushes to fit 12 guage, 20 guage, 410 guage, 45 cal., 40 cal., 357/38 cal./9mm, 30 cal., 270 cal., 22 cal., 17 cal.. This kit also contains 5 mops to fit 12 gauge, 20 gauge, 410 gauge, 357/38 cal,/9mm, 22 cal., 2 solid brass adaptors for shotgun mops/brushes and rifle/pistol brushes and mops, 2 plastic slotted ends for shotguns and rifles/pistols as well as 50 pieces of 3" X 3" cloth cleaning swabs.